Does anyone else use one of these? 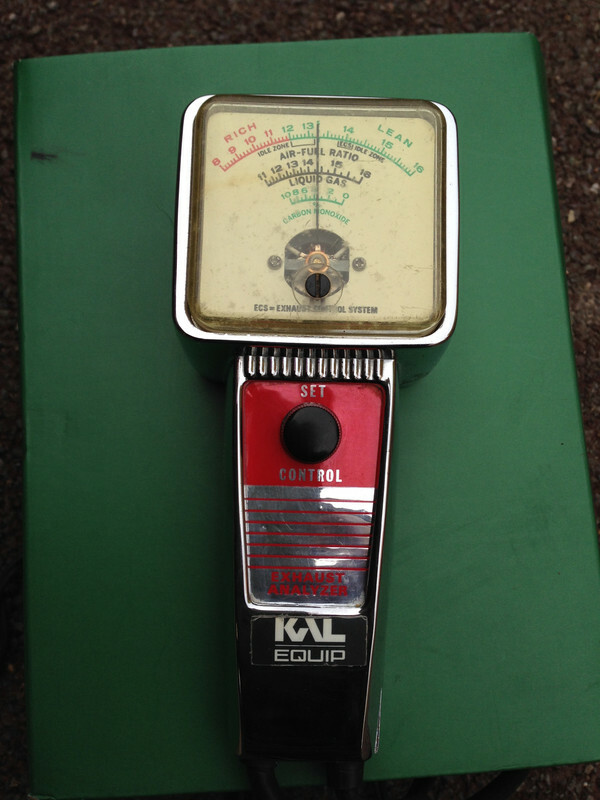 I have recently bought this 'KAL equip' analyser and found it useful for use on the old cars. I was pleased to find that I had not been that far out using the old "hit and miss" method. I have a selection of these, but no real idea whether any of them give a proper reading. I've got an ex-garage Sun DGA1800 (as used on MOT tests a few years ago), but that won't give a reading at all. My Gunson analysers don't behave the way they should during warm-up so I don't trust the figures they give, if they can be persuaded to settle on a figure and not just fluctuate wildly. 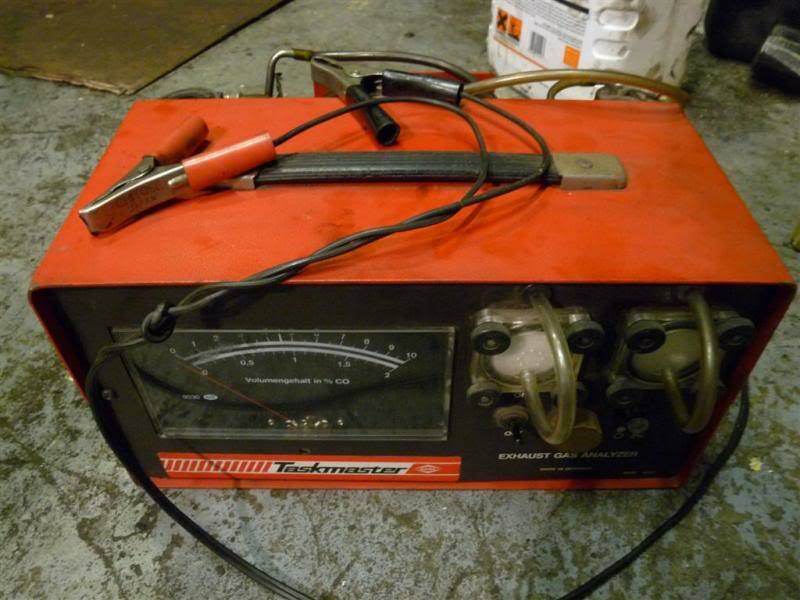 Last time I had an MOT issue I borrowed a gauge from a mate - even though it's not been calibrated in decades, it proved to be almost spot-on against the subsequent MOT test. Hi Mike. I have read varying reviews about the Gunson analysers but eventually opted for a used professional one. The problem as far as I can see is that the older ones like mine have no filters to capture the inevitable sooty particles. So far the KAL Equip (which I think is American) is working O.K. but quite how they work is a mystery to me. I think I'd be more fed up with the Gunsons had I bought them new at Halfords-style prices - both of mine were car boot sale bargains for a couple of pounds each. The Sun one is much more impressive, but it's decided internally that the calibration has drifted too far to give a meaningful reading, so it shows no values. I called Snap-on to see what could be done, and the chap there said that their engineers don't have the types of gas required to calibrate such an old device any more. So any time soon it will have to go back to the scrap heap I got it off, unless anyone wants it for spares. But I've offered it in several places and had no interest. I have one of these that I bought for £10 at an auto jumble. I found it pretty good for carb. balancing. Conveniently the SS has separate exhaust systems for the front three cylinders and back three cylinders. I think perhaps mine works in a similar way?? If you look at the photo of my hand held 'Kal' there is a black button and the words "set" and "control". With the device connected up to a battery the pump starts working and by turning the black button you can centralise the needle. Only when the engine is warm is the probe placed in the exhaust and the reading taken. Mine does LPG as well as CO2 but how that can be adjusted (if needed)I don't know. I leave that to the experts because I seem to remember you need a license for fuel injected installations.? There is an analyser in my shed that I dragged out to check the carbs on an SD1. The little bottle of gas for calibration was empty so I set it by trying one efi and one modern Japanese motor at idle. Assumed they would be at the very lean end of the idle mixture. That told me what I wanted to know. I was intending to do a similar thing with mine - get the car MOTed and get the emissions sheet from that, run my own tester on the same car and see if it gives roughly the same figures. The emissions test is always the part of the MOT that I don't look forward to, as it's the only thing I can't check out myself before I take the car. Of course, I've another option now as the car is exempt. My P38 is on LPG and is never tested for emissions. I rely on the specialists who did the conversion to tune the system. That reminds me...I must book it in for a LPG check. I've got an old 'Lantz Phelps' unit I found in a local antiques shop year ago cost me a tenner. It does work, and thankfully the original patent application is online so I could work out how to use it. Not sure how accurate it is however. Looks the part though!